PEM presented the first major American exhibition of Theo Jansen’s famed kinetic sculptures—a retrospective reflecting on 25 years of making. 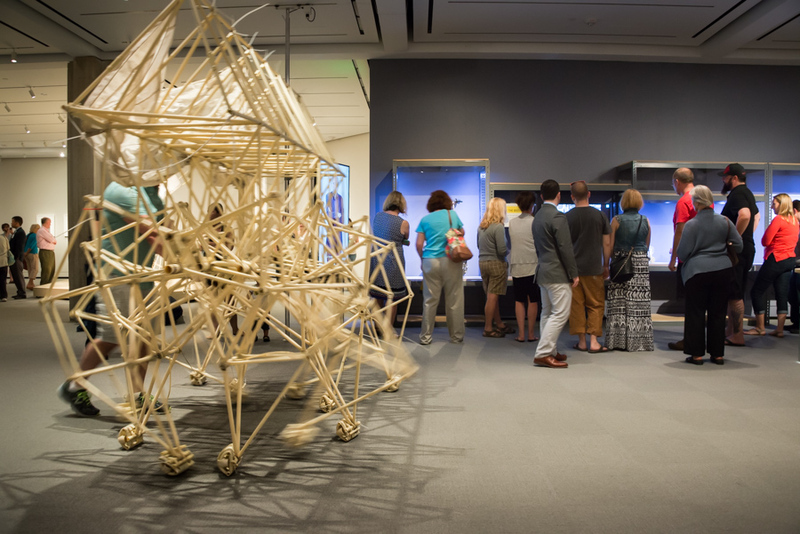 Dynamic and interdisciplinary, Jansen’s Strandbeests (“beach animals”) blur the lines between art and science, sculpture and performance. 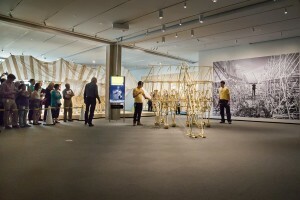 The exhibition celebrates the thrill of the Strandbeests’ locomotion as well as the processes that drive their evolutionary development on the Dutch seacoast. 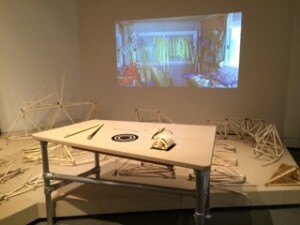 The kinetic sculptures are accompanied by artist sketches, facilitated demonstrations of the creatures’ complex ambulatory systems, a hall of “fossils” as well as photography by Lena Herzog. Interactive video screens sharing Theo’s story and daily movement demonstrations filled the galleries in unexpected ways. The design of the exhibition itself was multifunctional, multidisciplinary, and multisensory. Reshaping the approach to traditional curatorial text, this exhibition brought audiences into Theo’s world through location-activated screens highlighting Theo’s dynamic storytelling touching on thematic points in the exhibition (origin story, production, reproduction, evolution). Harnessing Theo’s spirit for rigorous experimentation, audiences explored the systems and materials that enable the Strandbeests’ movement through both facilitated demonstrations and unfacilitated interactives. This exhibition encapsulated an unexpected, unconventional, and highly experiential environment where elements seem oddly familiar and interactive–inviting audiences to feel immediately welcome to take risks, experiment, explore, and engage in active dialog. Strandbeest was almost entirely interactive. The thematic structure was inspired by dreaming—imaginative and non-linear experiences. Each experience zone harnessed a distinct level of audience engagement while retaining characteristics of Theo’s dream: to create a species that will live long after he is gone.The roving nature of the Beests themselves encourage touching, close looking, and constant locomotion. This led to incorporating constant movement interactions and demonstrations in an exhibition while also allowing for close looking and space to let curiosity wander. Visitors invited to walk the basic walking unit, Animaris Ordis and explore Hackbeests–beests created by other makers inspired by Theo’s genetic code. The exhibition itself has many moving parts: 7 full-size Strandbeests and digital and analog interactives bringing audiences closer to the Beests, including Beests made by other makers inspired by Theo. Visitors could push and pull a Beest—a popular aspect of the exhibition offering a memorable tactile experience. 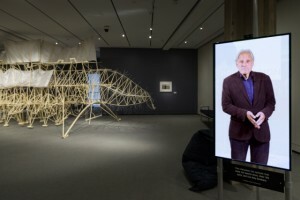 Theo’s role as a storyteller was critical for audiences to engage with the creation and evolution of the Strandbeests. The best way to convey Theo’s story wasn’t through text panels or labels, but through interactive film moments for audiences to hear Theo’s perspective in his own voice on a specific topic or theme. At various points in the exhibition audiences encountered a life-size digital version of Theo animated by proximity screen sensors. In these various zones, which we call “Theo Moments”, he told the origin story of the Beests, how the Beests are made, how they infect and reproduce through the minds of other makers, and ways in which the Beests have evolved over the past 25 years. Location activated Theo Moments replaced traditional gallery text. We featured a massive field of parts/fossils Theo created during his 25 years working on his Strandbeest dream. He calls his “fossils” evolutionary memories of countless hours of trial and error. Within this field of parts, we created an interactive that allowed audiences to hold a fossil and upon placing it on a target it animates a projection showcasing Theo’s studio. Theo walks into the screen and begins handling the object in your hand and telling you the story about the fossil itself. Interactive workbench where visitors explore Theo’s fossils. He appears when a fossil is placed on the target. We commissioned a trans-disciplinary group of key opinion leaders to “platform” around ideas like design, evolution, beach erosion, literary connection, biology and the environment. Key opinion leaders such as Adam Savage (Host of Mythbusters), Lawrence Weschler (writer), Lena Herzog (photographer), Michael Friedman (horologist and historian at Audemars Piguet), and Paola Antonelli (Senior Curator, Department of Architecture and Design, MoMA) were interviewed to discuss issues in their own work and how Strandbeests intersect with it. Trans-disciplinary Thinkers share how Theo pushes their own thinking in exciting ways. 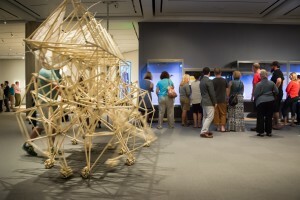 Strandbeest as an interpretive installation pushed many boundaries, especially for an art museum. The project team prototyped the exhibition at Miami Art Basel in December 2014 in partnership with Audemars Piguet. This was an exciting experience to actually (really, it happened!) experiment with how to incorporate constant movement interactions and demonstrations in an exhibition experience while also allowing for intimate close looking and space to let curiosity wander. We learned many things through this prototyping phase: from caring for the Beests, to how to effectively create space for interactivity and movement. All of which informed the final presentation and direction for the interpretive elements in the installation. Because Theo’s work thrives between the intersection of art, science, and storytelling, the installation was designed with our touring partners in mind. 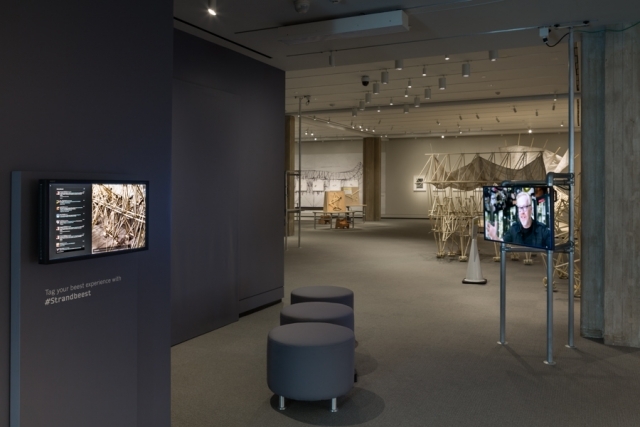 After shown at the Peabody Essex Museum in 2015, the exhibition and all interactive, interpretive components were shown at the Chicago Cultural Center (Feb 2016) and the national tour will conclude at San Francisco’s Exploratorium. The tour itself is emblematic of Theo’s work and the interdisciplinary approaches applied to the interpretive installation in each venue. 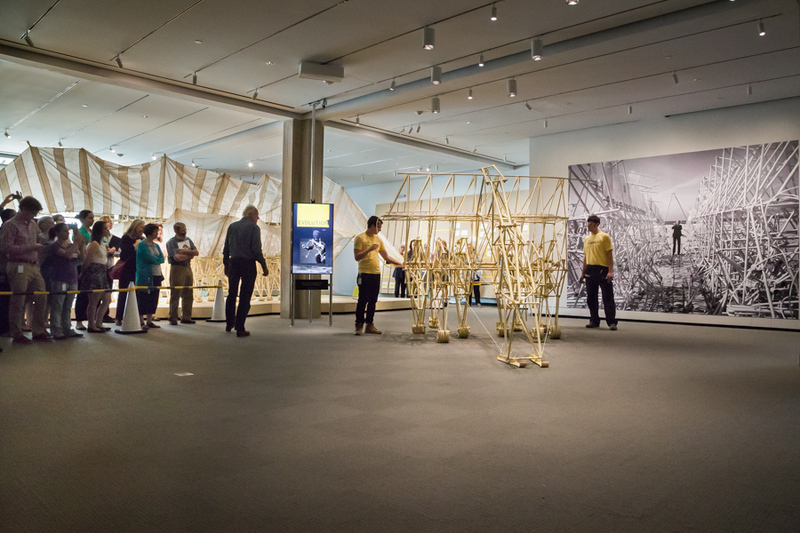 The interactive installation in Strandbeest has infected the Museum in many ways exciting ways. It has impacted how we worked both internally as a team since this project involved a healthy amount of cross-departmental collaboration, as well as influenced how we approach experiential exhibitions in general. 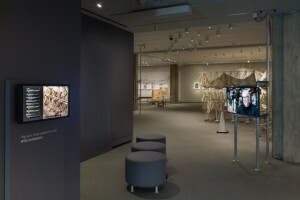 This open-ended approach to an exhibition that focuses on the pacing of experiences and pays close attention to the emotional experience of the audience is something the Museum has been working on for a long time, but you really see the integration of design, media, and the work itself coming together successfully in this project. I think this exhibition has also broadened our ability to think about how voice is privileged in the exhibition – is it as shared voice between the curator, artist, and visitor? How can we communicate and tell stories without any text panels? These were some of the creative challenges we imposed on ourselves and we are extremely excited to see how well it is being received by our audiences. 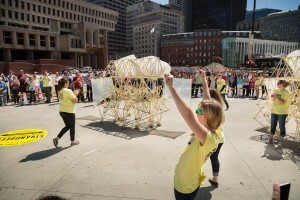 Strandbeests released on the grounds of Boston City Hall.